People’s Lobby’s mission is to foster the growth of democracy by improving the politics of America. This will include work in direct and indirect initiative processes, as well as educating, initiating, and training others in initiating citizen driven legislation. 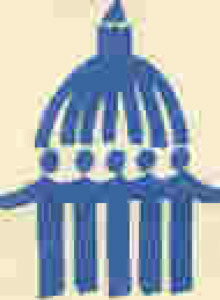 People’s Lobby has a storied history of non-partisan work, public education, and nation-wide campaigning and training that allowed it to develop Clean Environment, Safe Energy, Political Reform initiatives, and birth the idea of a National Initiative Process with Senate Judiciary Committee Hearings. People’s Lobby Inc’s (PLI) citizen-initiated American World Service Corps (AWSC) Congressional Proposal will be among the most significant legislation passed in decades. It will dramatically affect poverty, ignorance, hatreds, global climate change, etc… at home and abroad. It will address many of our daunting economic, educational, and environmental challenges by involving 21 million Americans in voluntary service over the next generation. PLI’s March 2009 draft piece of legislation , the Fair Tax Bracket Reinstitution Act, address the growing economic disparity facing America, while also linking revenues raised by it to involve Americans in experiencing service that will lead the nation to smarter, more cost effective public policies. 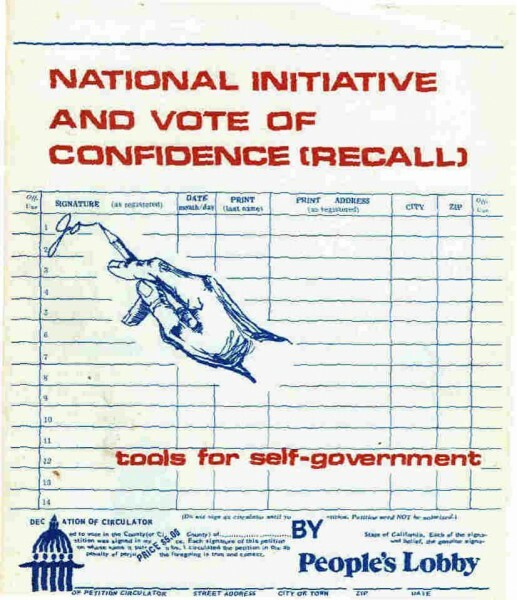 As the originator of the National Initiative movement in the 1970’s, People’s Lobby Inc. (PLI) will also continue educating Americans on the need to empower themselves as legislative initiators when the representative system fails them. 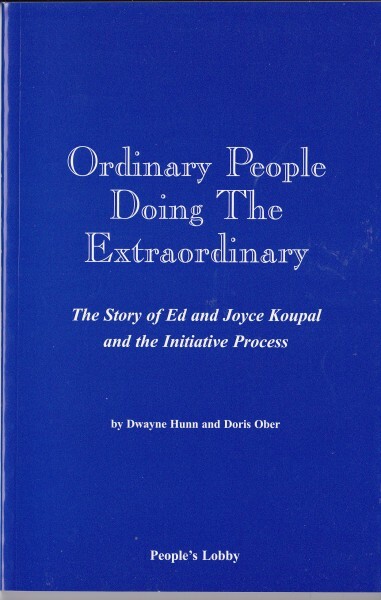 Edwin and Joyce Koupal planted this mission idea in the minds and hearts of the non-profit volunteer political organization they founded in the late 60’s. 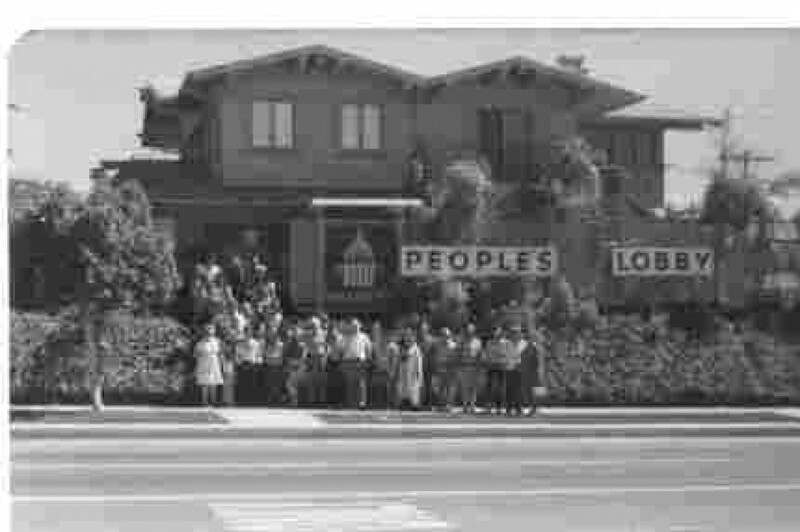 People’s Lobby Incorporated (PLI) then spread the initiative and national initiative gospel by working with and training grassroots organizations throughout the nation. The ideas and ideals that were often found in the words of the Koupal’s People’s Lobby must be part of any successful electoral campaign waged to give Americans another means of writing the laws they live under. 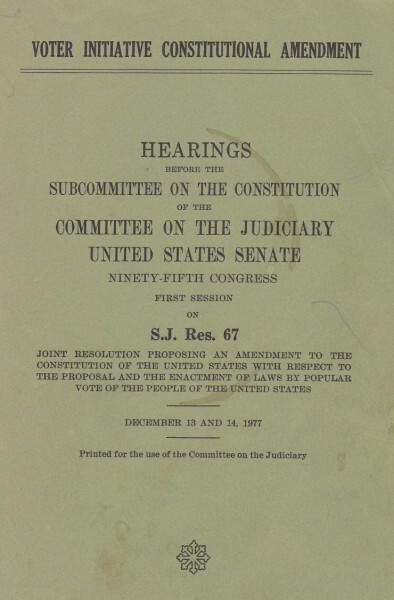 held the Nation’s first and only hearing on implementing a National Initiative Process, the 1977 Senate Judiciary Hearings on a Voter Initiative Constitutional Amendment For more details, click Brief History of People’s Lobby. 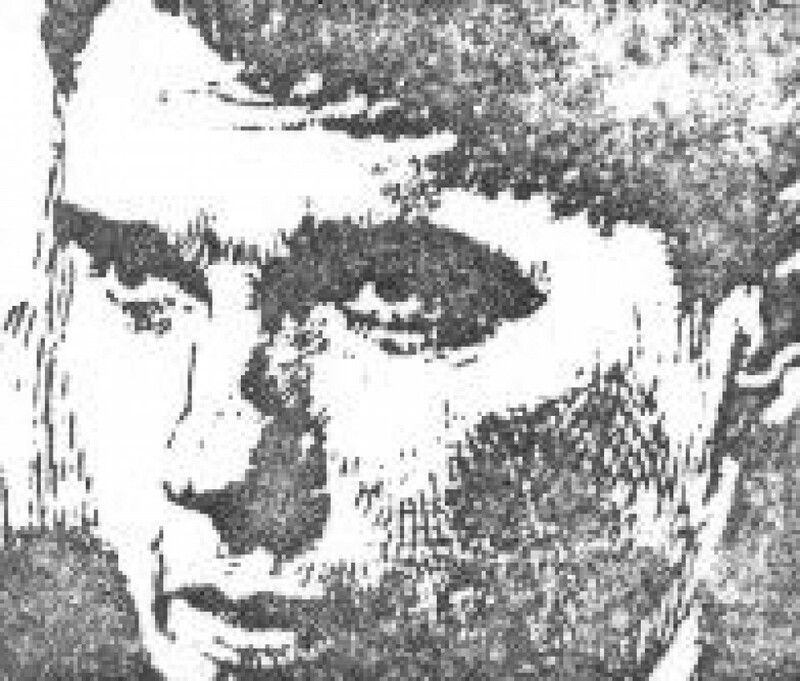 One of those participating in the 1977 Senate Judiciary Committee Hearings was Senator Mike Gravel (D-Alaska). As a maverick senator, Gravel supported the goals of adding citizen-made national law to the power presently given only to the citizens’ legislative employees. By the end of his second and final term as Senator, Gravel would readily admit that his ideals for better government had been “corrupted by the common desires of political ambition and recognition.” Gravel had learned first hand that too many powerful special interests existed forcing even idealistic Senators to “cut deals” that too often didn’t benefit the public good. 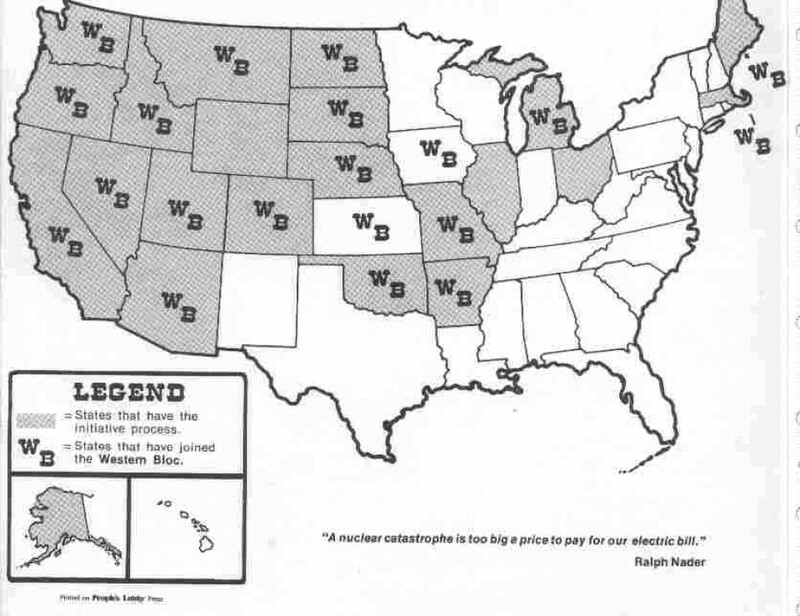 A “very tired and discouraged” Gravel left the Senate in 1981. He retreated with the desire “to get away from government, get away from politics and literally hide.” With time and the Monterey Peninsula as a recharging force, Gravel gravitated back to his desire to give citizens true power. 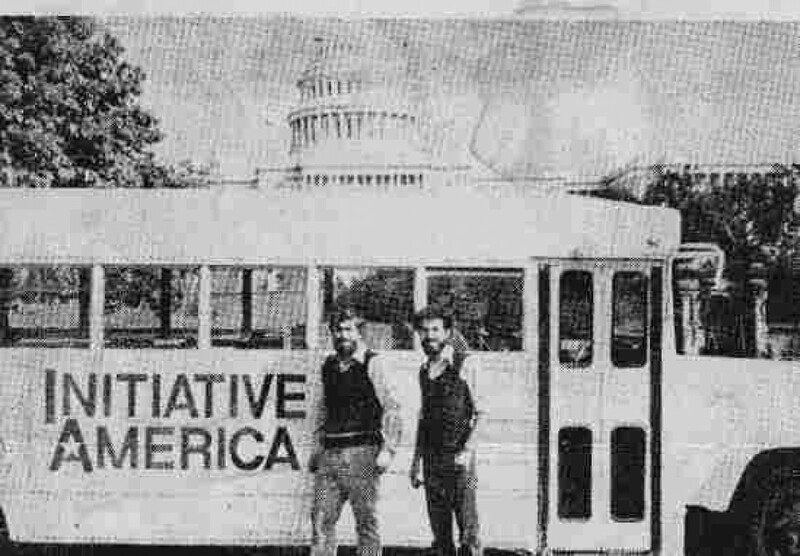 In the late 80’s and early 90’s Gravel found his thoughts and energies pushing him to design an updated national initiative process, which led to the founding of Philadelphia II and later Direct Democracy, non-profit educational organizations dedicated to pushing the national initiative idea forward. 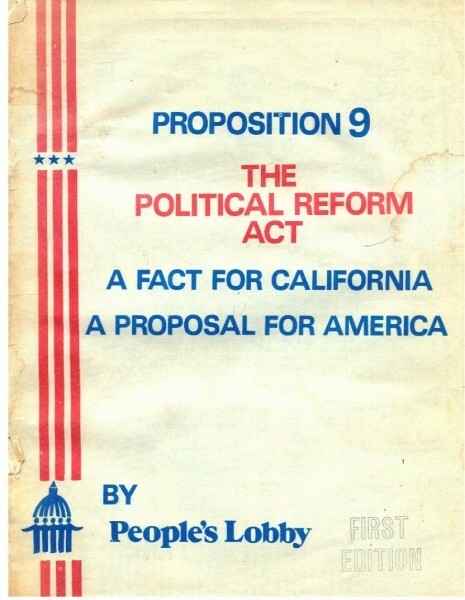 By 1995 Philadelphia II had placed an initiative on the Washington State ballot to allow Washingtonians to express whether they would like to see a national initiative in their future. When the Washington Attorney General denied the voters the opportunity to vote on the National Initiative process, Gravel fought the AG’s decision by arguing Philadelphia II vs. Gregoire before the Washington State Supreme Court. Undaunted by the Washington State Supreme Court defeat, Gravel filed a Certiorari appeal to the U.S. Supreme Court. 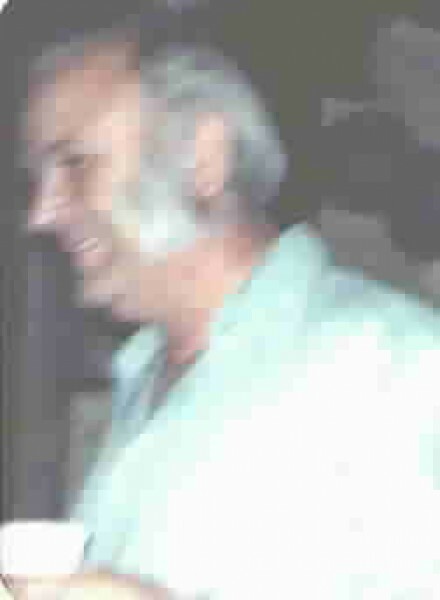 In the 1990’s, former U.S. Senator Mike Gravel began spending time with Dwayne Hunn of People’s Lobby and by early 2000 became a board member along with some of his then followers. Early in 2000 he began using People’s Lobby assets to push the national initiative idea. When his followers gained a majority position on PLI’s Board, he became Board President and entered into loan agreements to borrow PLI’s once substantial assets. Financially strapped PLI is still waiting, after repeated requests, for 2008 Presidential Candidate Mike Gravel and his organizations to begin making payments on loans of well over $400,000. Video recording of Philadelphia II vs. Gregoire wherein Senator Gravel argues against Washington’s Attorney General before the Washington State Supreme Court. Originally recorded in 1995 it is available at www.ni4d.org/resources/press at July 21, 2001 date. (Requires Free Real Audio Player). While working with a core of supporters to refine the National Initiative Proposal, People’s Lobby sponsored via a loan to Gravel’s organizations the three day Edwin and Joyce Koupal Memorial Conference – The Democracy Symposium in February 2002 in Williamsburg, Virginia. The conference had 19 of America’s pre-eminent scholars vet the (Direct) Democracy Act and Democracy Amendment — as the National Initiative Process Proposal. The strong support from scholars on the “first principles” foundation for the National Initiative Process Proposal and their positive suggestions on strengthening the document was another encouraging sign for the technologically and philosophically updated document that People’s Lobby pushed onto the national agenda in the 70’s. The scholars and their delivered papers from the Edwin and Joyce Koupal Memorial Conference – The Democracy Symposium can be viewed by visiting the Democracy Symposium. After sponsoring the Edwin and Joyce Koupal Memorial Conference, People’s Lobby loaned significant funds to Direct Democracy (DD) and Philadelphia II (PII), two other non-profits involved with the national initiative and at that time controlled by former Senator Mike Gravel PLI’s loaned funds covered expenses for: a Philadelphia II Dinner, the September 2002 Maine National Initiative kick-off campaign, NI4D web sites, NI4D voting technology, NI4D on-line fundraising as well as staffing, administrative, and legal expenses through 2002 and most of 2003. In addition, during this time PLI Board member Dwayne Hunn obtained a Koret Foundation grant which was intended to be used for PLI expenses. 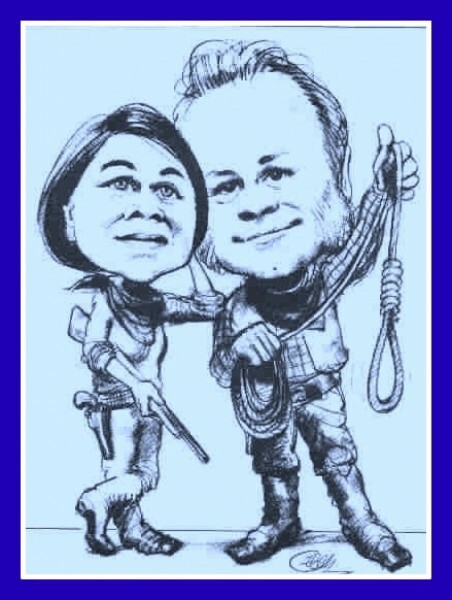 Former Senator Gravel converted that grant for the use of his other Direct Democracy and Philadelphia II organizations over the objections of PLI Board Member Dwayne Hunn. Unfortunately, Senator Gravel did a poor job of effectively managing PLI’s loans and with PLI’s coffers emptied, he along with his supporters resigned from the PLI Board. Since 2003 and into 2007, no payments on the $400,000 principle owed PLI has been made by 2008 Presidential Candidate Gravel or his organizations. Payback of PLI’s loans will determine, in large part, how much more support PLI is able to put into the National Initiative for Democracy Campaign. Loan payback would also help PLI more rapidly advance the critically needed American World Service Corps Congressional Proposals, Fair Tax Bracket Reinstitution Congressional Proposal and other issues PLI would like to address.